Ever wondered how your favorite online papercrafting stores came to be? 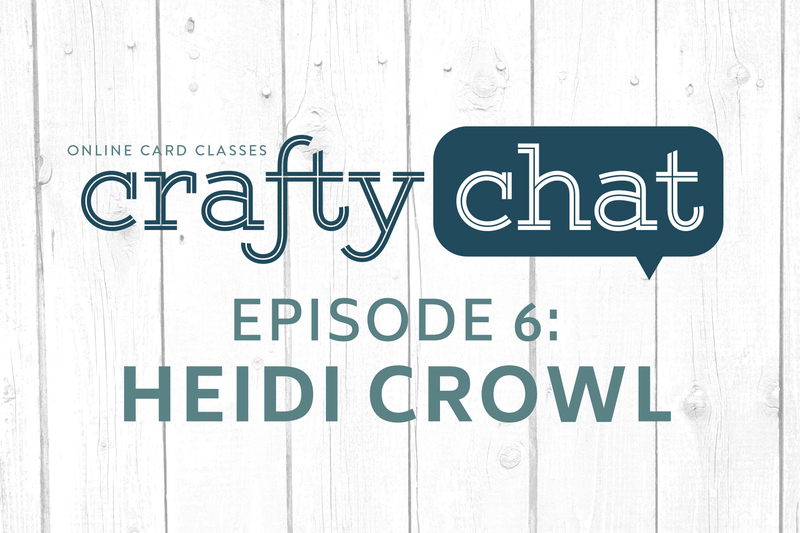 In today’s Crafty Chat, we are getting the backstory on Simon Says Stamp from its founder, the dynamo we all know as Heidi Crowl. Also, don’t miss the beautiful “about us” video from their site, for a peek inside the magical place all those orders are filled. This was so much fun! Thank you for allowing us in on your group chat — I love it all and getting to know each of you better. I ♥ SSS and Heidi, and each of you ladies!! Mahalo! Nice to finally see the faces of women I admire and hear about their start and what they do! Continued success with your work! It’s really great knowing there are other crafty people who enjoy what I love doing daily!! This was really delightful! i have enjoyed all of these chats so so much!! I really didn’t even know who Heidi was before this. (of course, i’m old, lol) i learned alot from all of you today. i think each time you all do a chat, i relax more. Just seeing the human side of all of you. It helps me in my creative process, to know that i am not the only one with some limitations and that you all have worked to get over yours. thank you all so much for sharing who you are and sharing your knowledge with us. I enjoy this series SO much! I liken it to card making/painting with a group of friends at the kitchen table and the chit chat that accompanies it! The employees with whom I have spoken, at SSS, are Rock Stars! They’re courtesy and knowledgeable and great to interact with (even when I called there all in a flap because the order I had placed the day before somehow had 3 glacier caves in it when I only meant to order it once!) Thanks for all that you do Heidi, Lydia, Jennifer and Kristina! Wow, I always assumed SSS was a big faceless corporation. This was an eye-opener for me. I order SO often from SSS, it really is meaningful for me to “meet” Heidi and be able to put a face to this amazing vendor. Now I love “Simon” even more! These chats are truly a great offering for OCC students. Thank you, Jennifer and Kristina! I am really enjoying listening to them. And it’s always nice to see/hear you somewhere other than Splitcoast, Lydia! You’re a fab chat moderator! I love SSS, but it takes forever to receive an order. It takes over 5 days just to process the order and then a few more days for shipping. I loved the chat. It’s always fun to hear about the behind-the-scenes of the business side of the big ‘ol sandbox we all play in. Please do more of these chats. Is there going to be a crafty chat with Ellen Hutson? I’d love to see one! I have a question for Jennifer. Are you sitting on the floor? absolutely loving this whole series but still trying to catch up. Love watching all of you and your work. I’ve watched 6 of the chats so far and I’ve loved every one of them! It’s so nice to put faces with names and see these crafty, amazing women and hear all about them! LOVE these chats! You need to keep doing them!! And Jennifer and others if youre not having a beer, I think you should…or a glass of wine… I am!! I’m really glad to know how SSS got started and how they run as a business. It means so much to have had the opportunity to “meet” Heidi. The chats are so much fun. As others, I love seeing the faces that go with the wonderful personalities that I have gotten to know over the last few years. The questions you pose are perfect for getting to know everyone. If I were younger and more physically able, I would make efforts to go places where you all are, so for me this is the next best fun thing. Thanks so much.